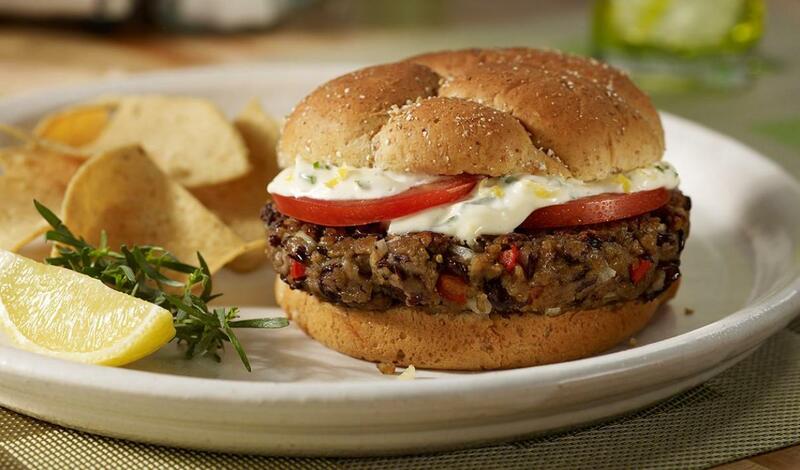 A spicy black bean burger served with fresh lemon-herb mayonnaise made from Hellmann's® Real Mayonnaise. Place cumin seeds in small sauté pan. Heat over medium heat, stirring frequently until toasted and fragrant, about 3-4 minutes. Remove from heat; cool slightly. Place seeds in pestle or small bowl, crush roughly. Combine black beans, breadcrumbs, red bell pepper, onion, garlic, salt, black pepper, eggs, and toasted cumin seeds. Coat sauté pan lightly with olive oil and heat over medium heat. Fry patties until lightly browned on both sides and heated through. Spread cut sides of bun evenly with prepared Lemon-Herb Mayonnaise and build burgers.